Aerial lift operators are busy building structures, maintaining buildings, and keeping our power running around the world. But climate changes, recent intense storms, and abnormal weather have made their jobs much harder and have called for even more preparation than they already put into their work. OSHA regulations and employer policies change the way aerial lift workers can do their jobs, and the weather is just one constantly shifting part of that. Aerial lifts can be dangerous in certain situations like high winds and blustery weather that impairs workers’ vision. 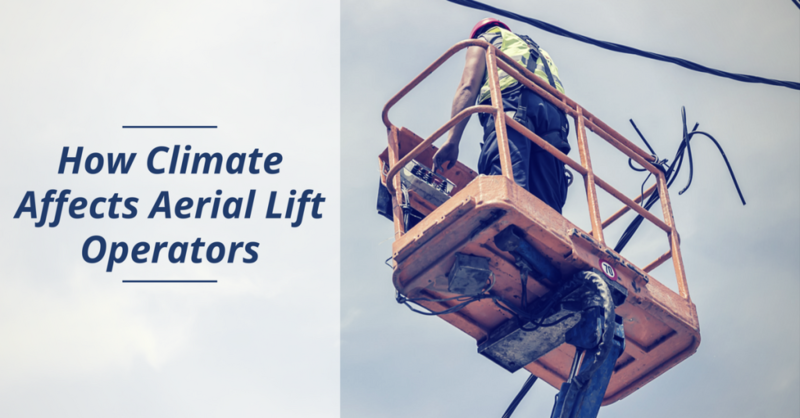 When in the elevated position, aerial lifts and scissor lifts can become unstable and tip over when weather isn’t ideal for working at heights. There are limits to the type of poor weather aerial lifts can work in, to keep workers away from harm. Serious weather has even convinced some employers to grant paid “climate leave” for employees during dangerous weather conditions that make it unsafe to travel for work. This is especially relevant for AWP operators who work outdoors and deal with heavy equipment and fall hazards. According to OSHA, it is an employer’s responsibility to ensure their employees aren’t forced into unsafe environments or imminent danger, like a storm or during severe weather for outdoor work. When employers dismiss bad weather and severe climates, they are in violation of OSHA regulations and are putting their workers’ lives at risk. – Strong winds. When you think weather, you probably think about temperature or precipitation. Strong breezes are an underrated part of the weather. Aerial lift operators should use extreme caution when winds get too severe – or stop their job temporarily. – Slippery surfaces. Snow, sleet, rain, ice – you name it, and Mother Nature can create slippery ground in no time. Always ensure your base is stable before going up in an aerial lift. – Hot and sticky temperatures. As a general rule of thumb, you shouldn’t operate an aerial lift or AWP when it’s too hot (over 90-100 degrees Fahrenheit). Extreme temps can cause loss of concentration – and that spells doom when you’re up in an aerial lift! Heat exhaustion is a major concern for aerial lift workers in hot, humid conditions. When the temps start to climb, keep a water supply within reach. – Cold and icy temperatures. Just like hot temps, the other side of the thermometer isn’t an ideal place for aerial lift workers. When the temps fall to less than 10 degrees Fahrenheit, the severe cold can cause numbness, lapses in concentration, and even severe pain! Take a break and warm up! – Severe weather patterns. Storms, hurricanes, and other severe weather systems are major hazards for aerial lift operators. If you’re working where bad weather is expected, get clearance from your safety supervisor before proceeding. The last thing you need is to be 100 feet up in the air when a thunderstorm strikes! Recent storms like hurricane Harvey and Irma left an incredible amount of damage in their wake. They also left hundreds of employees out of work or feeling pressured to stay at work even when weather warnings were sounding. While severe weather is a huge hazard for workers that forces employers to cancel work, many aerial lift operators work in poor weather every day. Whether you’re an employer or an employee who wants to know their rights, the training courses from CertifyMeOnline.net will teach you how to operate aerial lifts safely, prevent accidents, and remain OSHA-compliant at all times. Look into our affordable, online certifications today. This post was originally published in 2017 and updated to include more safety tips in 2018. This entry was posted in Aerial Lift Certification on December 7, 2017 by admin.